Very Special Feelings: a very special benefit. With what might be one of the most aggressive and appropriate names for a production this week, Sinner Saint’s new run- Forces of Nature– cuts a proverbial swath tonight at Noc Noc. Tomorrow you can see a softer side of the ladies as they read from their journals while improvisationally stripping to make a buck. Very Special Feelings is a fundraising show to help the Seattle burlesque troupe make it to London in March, where they have been invited for a two week residency to accompany photographer Greg Holloway’s photo exhibit. A few weeks ago, Belle Cozette told me she was inspired by the recent appearance of legends Joan Arline and Dixie Evans at the Gypsy Rose Lee Centennial show (see my review HERE as well as Dixie Evans & Joan Arline interviews soon to be published on BSP). As a result, we can expect to see her performing much more this year- in addition to reading at Very Special Feelings, she’ll also be reading in nothing but her beautiful skin at Naked Girls Reading’s Love Stinks! this Sunday at West Hall. Click HERE for tickets. Belle Cozette says she'll perform more in 2011. Hip hip HOORAY! And speaking of Gypsy Rose Lee…everyone’s talking about Karen Abbott’s new book, American Rose. Karen Abbott herself will be speaking about the complex icon and her excellent biography tonight at Elliott Bay Books. Tomorrow the book tour takes Ms. Abbott to our sister city, Portland- hot on the heels of the Mercury’s just published review penned by Burlesque Seattle Press contributing author & burlesque entrepreneur Rayleen Courtney. Check out Rayleen’s fab review HERE. 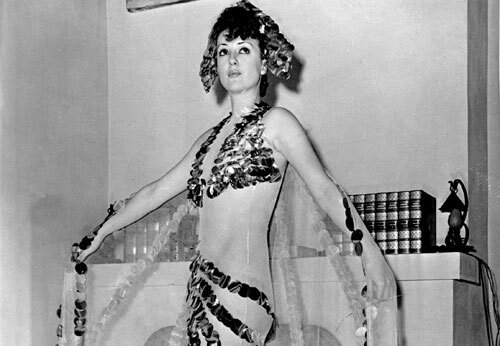 Today’s bonus photo: an Associated Press photo of Gypsy Rose Lee’s “Eclipse of the Sun” number that struck me as a possible prototype for Julie Atlas Muz’s “Waiting for the Sun” act. If you haven’t seen it, Julie is arresting and in your face as usual; her costume looks a little like the photo below- only bigger and more amazingly gaudy and elaborate. ~ by angrytruffle on 02/03/2011.